GERD, or gastroesophageal reflux disease, is a chronic condition with symptoms like acid reflux and heartburn. It occurs when stomach contents make their way back up the esophagus and into the throat or mouth area. This disease can occur in infants, children and adults. Symptoms can vary, but most individuals share most of the same side effects. Diagnosis of child GERD can be difficult as some symptoms are similar to other health concerns. When the stomach contents make their way back up into the larynx and mouth area, a 4-year-old may report having a sour taste in his mouth. He may also state that he "threw up" in his mouth or something similar signifying the return of stomach acid. As the acid crosses over the vocal cords and airways, a child may develop a sore throat, hoarseness, difficulty or pain when swallowing or a dry cough, according to the National Institute of Diabetes and Digestive and Kidney Diseases (NIDDK). Unlike infants, a child may not spit up but instead will swallow the regurgitated substance. These and other signs of GERD are often misattributed to other ailments. Like an adult, a child may report a burning sensation in the chest or "heart," known as heartburn. According to Reflux.org, parents often do not realize heartburn or GERD is possible and common in children. Without realizing it, parents may overlook symptoms that could help a doctor diagnose a child correctly. For example, a child with chronic wheezing or breathing difficulties may be tested for asthma and/or allergies. Other symptoms, like regurgitation, may be left out of the conversation, resulting in more time passing before GERD is considered. Other symptoms of heartburn in children include vomiting, spitting up, belching frequently or complaining of a painful stomach. The symptoms of heartburn can be triggered by spicy foods, chocolate, caffeine, carbonated sodas and citrus fruits. By reducing the consumption of these foods, the symptoms of GERD should also decline. When a child's digestive tract, especially the larynx, is exposed to acid it can become so inflamed that other health concerns develop. Recurrent pneumonia, wheezing, weight loss and asthma are all potential complications of GERD, according to NIDDK. Other signs of GERD may include laryngitis and refusing to eat, points out the Mayo Clinic. A 4-year-old may report experiencing things like chest pain when breathing or difficulty catching her breath, and will display obvious symptoms of illness when she has contracted pneumonia. Infant signs of GERD may be easier to discern as he will refuse to eat, arch his back and cry often. 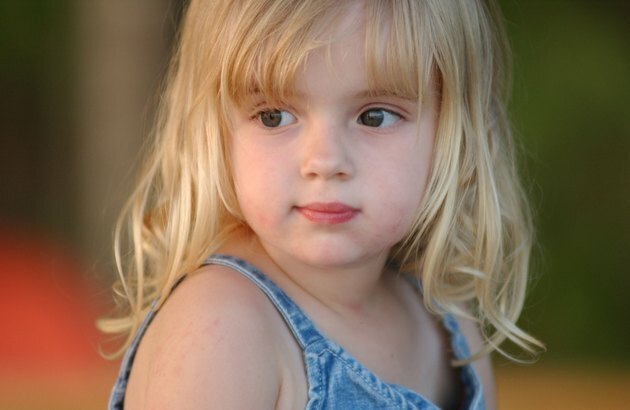 Children are more likely to report stomach troubles, have the hiccups or describe other typical toddler pains. Without evidence, these claims may seem like made-up excuses to get out of doing something the toddler dislikes.